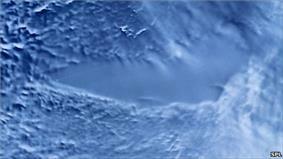 NASA MODIS image of two subglacial lakes in Antarctica. A subglacial lake is a lake under a glacier, typically an ice cap or ice sheet. There are many such lakes, with Lake Vostok in Antarctica being by far the largest known at present. The water below the ice remains liquid since geothermal heating balances the heat loss at the ice surface. The pressure causes the melting point of water to be below 0°C. The ceiling of the subglacial lake will be at the level where the pressure melting point of water intersects the temperature gradient. In Lake Vostok the ice over the lake is thus much thicker than the ice sheet around it. The water in the lake can have a floating level much above the level of the ground threshold. In fact, theoretically a sub-glacial lake can even exist on the top of a hill, provided that the ice over it is so much thinner that it creates the required hydrostatic seal. The floating level can be thought of as the water level in a hole drilled through the ice into the lake. It is equivalent to the level at which a piece of the ice over it would float if it were a normal ice shelf. The ceiling can therefore be conceived as an ice shelf that is grounded along its entire perimeter, which explains why it has been called a captured ice shelf. As it moves over the lake, it enters the lake at the floating line, and it leaves the lake at the grounding line. For the lake to exist there must be a hydrostatic seal along the entire perimeter, if the floating level is higher than the threshold. A hydrostatic seal is created when the ice is so much higher around the lake that the equipotential surface dips down into impermeable ground. Water from underneath this ice rim is then pressed back into the lake by the hydrostatic seal. The ice surface is ten times more important than the bed surface in creating the hydrostatic seal. This means that a 1 m rise in the ice surface at the ice rim is as efficient as a 10 m rise in the bed level below it. In Lake Vostok the ice rim has been estimated to a mere 7 m, while the floating level is about 3 km above the lake ceiling. If the hydrostatic seal is penetrated when the floating level is high, the water will start flowing out in a jökulhlaup. Due to melting of the channel the discharge increases exponentially, unless other processes allow the discharge to increase even faster. Due to the high head that can be achieved in subglacial lakes, jökulhlaups may reach very high rates of discharge. 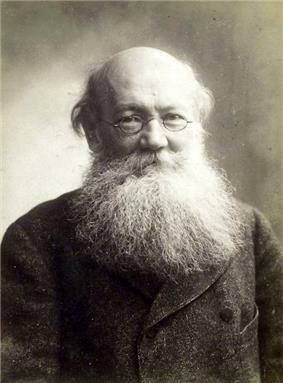 Russian scientist and anarcho-communist Peter Kropotkin first proposed the idea of fresh water under Antarctic ice. Russian scientist Peter Kropotkin first proposed the idea of fresh water under Antarctic ice sheets at the end of the 19th century. He theorized that the tremendous pressure exerted by the cumulative mass of thousands of vertical meters of ice could increase the temperature at the lowest portions of the ice sheet to the point where the ice would melt. Kropotkin's theory was further developed by Russian glaciologist I.A Zotikov, who wrote his Ph.D. thesis on this subject in 1967. Andrey Kapitsa used seismic soundings in the region of Vostok Station made during the Soviet Antarctic Expeditions in 1959 and 1964 to measure the thickness of the ice sheet. In cooperation with other scientists, Kapitsa discovered a subglacial lake in this region, later named Lake Vostok, which was one of the most remarkable geographical discoveries of the 20th century. Subglacial lakes in Antarctica were also suggested by Oswald and Robin (1973) and subsequently confirmed theoretically by Oswald (1975). They are identified in radio-echo sounding data as continuous and specular reflectors which dip against the ice surface at around x10 of the surface slope angle, as this is requirement for hydrostatic stability. The largest lakes are clustered in the Dome C-Vostok area of East Antarctica - possibly due to the thick insulating ice and rugged tectonically influenced subglacial topography. The largest is Lake Vostok with other lakes notable for their size being Lake Concordia and Aurora Lake. Several lakes were delineated by the famous SPRI-NSF-TUD surveys undertaken until the mid-seventies. A compilation by Siegert et al. (2005) reported 145 subglacial lakes in Antarctica. Since this original compilation several smaller surveys has discovered many more subglacial lakes throughout Antarctica, notably by Carter et al. (2007), who identified a spectrum of subglacial lakes types based on their properties in radio-echo sounding datasets. Gray et al. 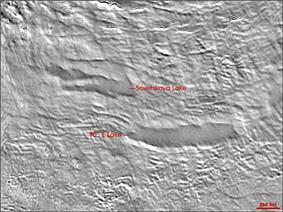 (2005) interpreted ice surface slumping and raising from RADARSAT data as evidence for subglacial lakes filling and emptying - termed "active" lakes. Wingham et al. (2006) used radar altimeter (ERS-1) data to show coincident uplift and subsidence: implying drainage between lakes. NASA's ICESat satellite was key in developing this concept further and subsequent work (e.g. Fricker et al. 2007; Fricker et al. 2010) demonstrated the pervasiveness of this phenomena. ICESat ceased measurements in 2007 and the detected "active" lakes were compiled by Smith et al. (2009) who identified 124 such lakes. In total around 250-300 subglacial lakes are currently known in Antarctica. The realisation that lakes were interconnected created new contamination concerns for plans to drill into lakes. There are currently three projects to directly sample subglacial lakes in Antarctica. These are the British led Subglacial Lake Ellsworth project, the U.S. led Whillans Ice Stream Subglacial Access (WISSARD) and the Russian led Lake Vostok program. Currently no program has gained access (as of Nov 2011) but is expected during the austral summer of 2011-12. The role of subglacial lakes on ice dynamics is unclear - certainly on the Greenland Ice Sheet subglacial water acts to enhance basal ice motion in a complex manner (e.g. Zwally et al. 2002). The "Recovery Lakes" lie at the head of a major ice stream and may influence the dynamics of the region (Bell et al. 2007). A modest (10%) speed up of Byrd Glacier may have been influenced by a subglacial drainage event (Stearns et al. 2008). The flow of subglacial water is known in downstream areas where ice streams are known to migrate, accelerate or stagnate on centennial time scales and highlights that subglacial water may be discharged over the ice sheet grounding line (Fricker and Scambos 2009). There is also evidence that there are subglacial lakes on Jupiter's moon Europa. Not all lakes with perennial ice cover can be called sub-glacial, though, since there are also those that are covered by regular lake ice. A criterion for glacial ice is that it is flowing. Ice needs to be approximately thirty metres thick to start flowing, so frozen-over lakes are unlikely ever to transform themselves into subglacial lakes. ^ Siegert, MJ; J. Cynan Ellis-Evans, Martyn Tranter, Christoph Mayer, Jean-Robert Petit, Andrey Salamatin, John C. Priscu. (2001). "Physical, chemical and biological processes in Lake Vostok and other Antarctic subglacial lakes". Nature 414 (6864): 603–9. ^ a b Erlingsson, U. (2006). "Lake Vostok behaves like a ‘captured lake’ and may be near to creating an Antarctic jökulhlaup". Geogr, Ann. 88A (1): 1–7. ^ a b "Appeal to the Duma on Lake Vostok, Antarctica". Antarctic and Southern Ocean Coalition. April 14, 2008. Retrieved 2011-02-10. ^ "Andrey Kapitsa dies in Moscow". Date Pinned Down for Ancient Antarctic Flood – By determining the date of an ancient subglacial flood, scientists have linked it to a previous global warming trend.